We understand that no two insurance companies have the same operational procedures, business strategy, or financial goals. Rather than implement a one-size-fits all administrative solution, we take a consultative approach with every client to learn how we can best serve you. Then, we customize the services to support your business where you need it the most. Through our extensive knowledge and deep expertise in the insurance IT industries, we provide a broad spectrum of innovative business process solutions for the individual, group, and worksite insurance markets for life and health insurance products. Reduce paperwork and minimize the administrative burden on your in-house staff by letting us manage new business processing. Our proven methodologies and industry expertise can help you shorten the new business cycle while increasing volume and reducing overhead costs. We capture application data from the point of receipt and automate document classification to expedite processing and ensure accuracy. We can even send a message to the insurance agent or insurance advisor when information is missing. Learn more about our New Business Services. From policy issue to premium billing, we offer comprehensive policy maintenance services, and our knowledgeable and friendly call center representatives will ensure your policyowners receive exceptional support. Learn more about our Policyowner Services for Life Insurance Products. 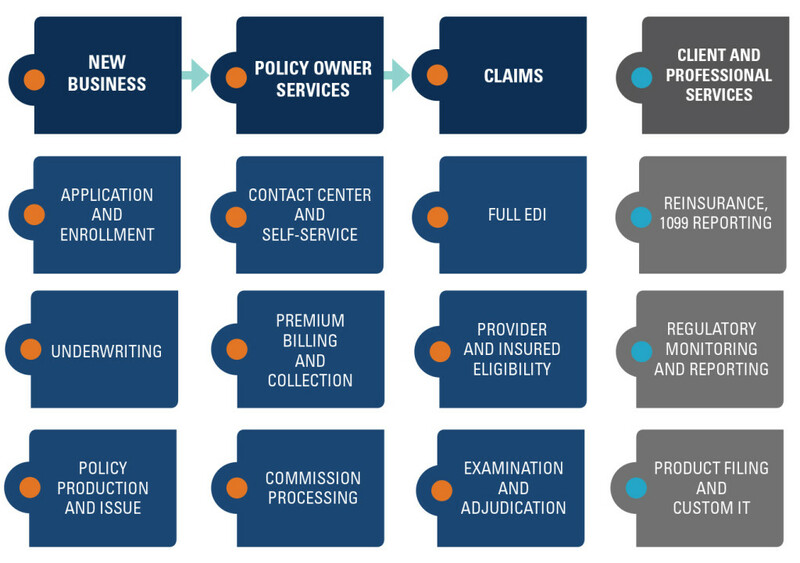 Every IAS client is given the unique toll-free number for policyholders and agents. As an extension of your brand we seek to understand and embrace the culture of your organization, the level and quality of service your customers have come to know and expect when doing business with you. We then emulate that experience, and have a proven record of service excellence across industry metrics such as average speed of answer and abandon rate. More and more today policyholders and agents want service automation, to fit their busy schedules, from their desktop to their mobile device. IAS manages a unique suite of portals, for policyholders, for agents, and even a portal for Medicare providers seeking benefit and eligibility information about their patients. These portals are easily customized to fit your brand requirements, and are constantly evolving to keep pace with advances in technology and the ever increasing demands of our customers, and yours. We bill and collect premiums across all modes and funding mechanisms for the individual, group and list-bill insurance markets. As part of our comprehensive Insurance and Reinsurance Accounting services, we offer all types of premium billing, including electronic funds transfer, direct billing, group list bills, and government allotments. For premium collection, we use bank lock boxes and remote deposit capture to ensure you receive same-day credit for all premium deposits. Learn more about our Insurance & Reinsurance Accounting Services. We offer a comprehensive compensation system and commission management support for Insurers, IMO’s, BGA’s, brokers, agents and insurance agencies, including commission advances and earned commissions. Our dedicated agent portal makes it easy for producers to manage their business and track their earnings, reducing back office administrative tasks for your business and increasing agent retention. Learn more about our Commission Accounting & Processing Services. More than 90% of our Medicare Supplement, life and health insurance product claims are received and processed electronically, reducing paper waste and ensuring a quick and accurate turnaround for your customers. We also pay insurance claims on products requiring rigorous eligibility review at the point of claim, such as Long Term Care and Disability insurance. We process more than 3.5 million claims annually and pride ourselves on prompt, efficient and courteous customer service. Learn more about our Medicare Supplement Claims Processing Services. Fully automated Electronic Data Interchange (EDI) for high-volume transactional claims associated with ICD10 dependent health products. Insurance administration at IAS is a set of complex tasks made simple. We are insurance industry experts, first and foremost, and we understand that no two companies are alike. So we take a consultative approach and wrap around our administrative solutions with a full suite of professional services. From policy drafting, to compliance filing, to regulatory monitoring and reporting IAS is your complete solution if you need that level of service, or we can augment your core competencies as desired. IAS handles reinsurance accounting, 1099 process and a range of complimentary functions. Lastly, IAS delivers all services with technology and processes customized to your unique needs. We take the headache out of insurance compliance with all-inclusive administrative support services that ensure you stay current on all insurance regulatory requirements. By monitoring and communicating time-sensitive compliance issues, we have developed long-standing, trusted relationships with state insurance departments and other regulatory agencies. We also review updates from the Centers for Medicare & Medicaid Services (CMS) for any federal changes that affect the insurance business and our clients. Learn more about our Compliance & Regulatory Support Services. We manage portals for agents, policyholders and insurance providers, with each site offering an ever-expanding array of self-service capabilities. Our policyholder dashboard gives your clients easy access to the tools they need to apply for coverage and manage their account online. Our agent portal includes a robust compensation system and end-to-end commission management support, and our proprietary software can be customized to meet the needs of your business. Producers can easily manage their business and track their earnings with a few keystrokes, reducing paper waste, minimizing back-office workload and increasing agent loyalty. Learn more about our Agent Services & Portal.